A close relative to the commercial Cashew tree, the Wild Cashew, locally known as Espavé, is a huge, common tree in the lowland humid forests of Central Panama. Standing up to 60 m tall and with a trunk up to 3 meters in diameter, this is no doubt a forest giant. This tree is distinguished by its coarse bark, deeply grooved and sometimes flaking. It lacks large buttresses, but the base of the trunk is somewhat enlarged. The sap is rust colored. Leaves are alternate and spiraling at the end of each branch; leaf blades are 9-40 cm long and 5-16 cm wide, widest near apex, forming an inverse teardrop shape. Each leaf has numerous pale veins. Leaves on young trees are much longer than mature leaves. Older leaves have yellow veins near tip. Flowers are small, creamy green to pinkish in color. They are arranged in inflorescence of loose, broad clusters at ends of branches. Flowers bloom from December to April during Panama’s dry season. They produce a strong, sweet, clove-like scent. Fruits are fleshy and kidney-shaped, 3-4 cm long and resemble a cashew. They form on a twisted, fleshy appendage, 3 cm long. 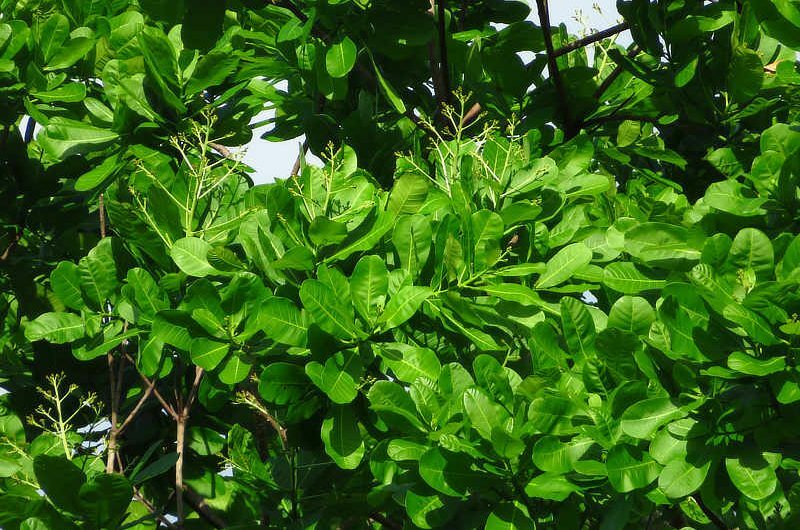 The Wild Cashew tree fruits from March to June, and fruits are eaten by many birds and mammals. Seeds are dispersed by fruit-eating bats—they eat the fleshy fruit and drop the nuts for germination. The nut contains a very toxic oil, but is edible if roasted. Wood is soft and light, and can be used for construction, tools, furniture and boxes. The Wild Cashew is a very conspicuous and dominant tree in the forests surrounding the Canopy Family lodges, and one of the most abundant around central Panama. It ranges from Costa Rica to northern South America, and often found along riverbanks. The Wild Cashew and commercial Cashew tree (Anacardium occidentale) are members of the family Anacardiaceae, which contains approximately 700 species worldwide, and 170 species in Tropical America. Most are trees or shrubs, a few species are lianas. This family is mostly tropical, with the best known species to be mango and cashew, but few are temperate including sumacs and poison ivy. Fun Fact: The tree house at the Canopy Lodge is situated in a 150-year old Espavé. The branches support a huge diversity of epiphytic plants. Next time you are at the Canopy Lodge, be sure to climb up to our tree house and immerse yourself in the beauty of this spectacular tree!